Lebanon is a country of karst areas rich with mountains that offer spectacular scenery and scenic view and the mountainous caves are spread in different regions. In one of these regions in the valley of Nahr El-Kalb at 18 km North of Beirut, is found Jeïta Grotto, one of the most marvelous natural wonders in the Middle-East, in spacious greenery. The road leading to the caverns is carved in the mountains and surrounded with trees. The all-around nature is perfectly in tune with the site. Jeïta Grotto is the jewel of tourism in Lebanon offering to its visitors qualified modern services and accommodation in harmony with a fascinating nature. It creates a magical trip which enables them to spend a day of wonder-filled adventure by being carried away from a tangible world to a wonderland where are found 2 limestone crystallized grottoes characterized by extraordinary concretions of stalactites and stalagmites sculpted naturally in different forms, sizes and colors. It is a source of attraction for whole the families wishing to discover a mysterious world in the heart of the earth. The “Touristic Site of Jeïta” gathers all elements of nature such as stone, water, trees, flowers, air and animals in a verdurous environment and with a touch of Lebanese cultural heritage. It is one of the most impressive and interesting natural sites in the world. The grotto was discovered in 1836 by an American missionary who, venturing some 50 m into the cave, fired a shot from his gun and found a cavern of major importance. 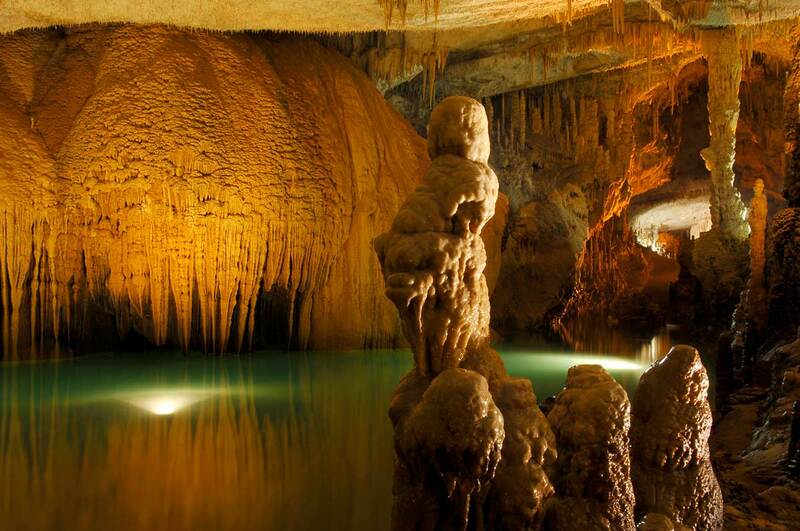 Jeita Grotto is the superb work of Mother Nature. It’s unimaginable how nature has sculpted such a masterpiece! At every step an astonishing limestone formation will surprise you! A lower cave (temp.16°) opened to public in 1958 and where visitors will take a short dreamy cruise in a rowboat at a distance of some 400 m from the cave’s total of 7800 m, and marvel at the majestic forms of otherworldly concretions. You will discover a huge stalagmite formation leaning to one side similar to the Pisa tower. This boat ride offers a relaxing trip whilst gliding calmly into a tranquil river which reflects delicate limestone formations in a profound silence broken occasionally by the melodious sound of water drops. An upper cave (temp.20°) inaugurated in 1969 and where visitors will have a walking tour and be staggered at the view of extraordinary stone forms of curtains, columns, draperies, and mushrooms at a distance of some 700 m from the cave’s total length of 2200 m. The cavern is so serene that it seems like an enormous cathedral. You will find one of the biggest stalactites in the world measuring 8,20 m as well as tiny stalagmites looking like candles, pillars and columns in several sizes, coral pipes, giant organs, flowing stone draperies and curtains lengthening 28 m, a giant tulip, a big mushroom heightening 26 m, autumn trees, flasks, etc…. 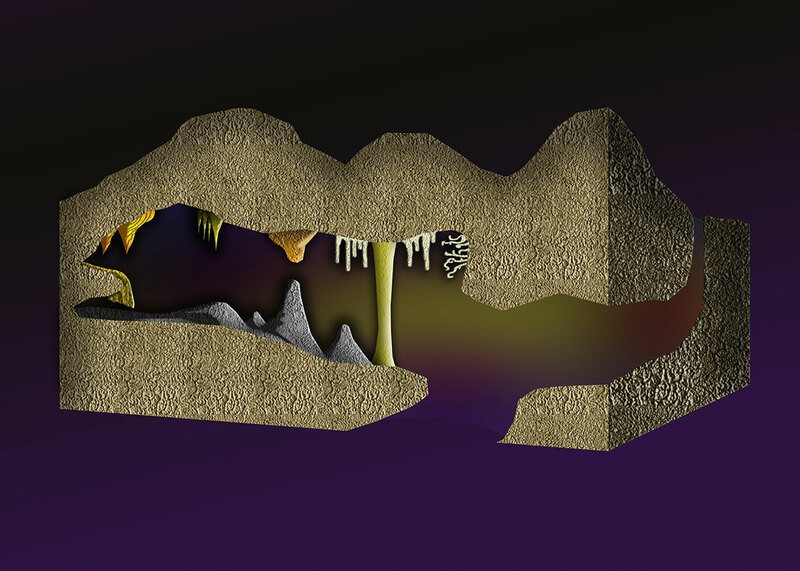 All these dimensions and stylish calciferous models characterize the specific beauty of this grotto and make it unique in the world of caverns. – An efficient transport system for visitors inside the site via a ropeway and a train. – A family restaurant and snacks serving appetizing lunches and sandwiches. – “Souvenir shops” with handmade oriental articles. – An enormous statue called “Guardian of time”, height 6,6 m and a relaxing “Phoenician garden”. – Outdoor craftsmen with their skillful handcrafted art. – A small zoo with pet animals. Tuesday – Sunday: 9.00 a.m. – 5.00 p.m. In wintertime, the lower grotto is closed for a few days due to water level rise. The complete tour takes around 2 hours. After 15 years of civil war in Lebanon, the whole infrastructure of Jeïta Grotto was damaged. The installation and the cabins of the ropeway, the parking and the administration and restaurant buildings were all destroyed. A great job was required to revitalize the “Touristic site of Jeïta” for rebuilding and maintaining it; that’s why, the Minister of Tourism awarded MAPAS Co. to rehabilitate the site after the damage caused to its infrastructure. An agreement on BOT basis was signed between Mapas Co. and the Ministry of Tourism to operate the complex by restoring, extending and modernizing it. A lot of work was waiting for Dr.-Eng. Nabil Haddad, General Manager of Mapas Co., after he has been charged with site’s reconstruction in order to prepare the caves for opening to the public. The main purpose of this project was to show our wonderful cave to visitors and to protect it and to display the beauty of Lebanon to tourists. Consequently, Mapas Co. undertook an intensive restoration program in touristic, environmental and cultural fields to improve the site condition and to make this site a popular tourist destination as it was before its closure due to war. New ropeway was installed in the site and solid rowboats for lower grotto were brought for more safety of visitors. Continuous project development was achieved within 1 year and 4 months and millions of dollars in investment, and the wonder of nature was reopened again with a new face to public in 16 July 1995. The development has been done in harmony with nature and the fact that the grotto represents a very sensitive biotope was taken into consideration. From the total amount of entry tickets, around 40% goes to the Lebanese government and Municipality and Mapas Co. pays all the charges and fees. a- L’éclairage actuel de la grotte est satisfaisant et ne nous apparait point porter préjudice à la roche. b- Nous n’avons remarqué aucune trace de mousse ou de végétation qui aurait pu être le résultat d’un éclairage inadéquat et intensif. 26/09/1995- Rapport d'expertise effectué pour le Ministère du Tourisme re. éclairage de la grotte: a- L’éclairage actuel de la grotte est satisfaisant et ne nous apparait point porter préjudice à la roche. b- Nous n’avons remarqué aucune trace de mousse ou de végétation qui aurait pu être le résultat d’un éclairage inadéquat et intensif. 16/08/1999 – “I have inspected the Lighting system at the grotto and I am glad to say that I have found no fault with the lighting solution or with the choice of lamp types. The system is in accordance with international standards in such applications and is similar to lighting systems used in Europe in similar environments. I would like to take the opportunity to compliment your co. on the professional and efficient way it is operating this very important heritage site”. 16/08/1999 – “I have inspected the Lighting system at the grotto and I am glad to say that I have found no fault with the lighting solution or with the choice of lamp types. The system is in accordance with international standards in such applications and is similar to lighting systems used in Europe in similar environments. I would like to take the opportunity to compliment your co. on the professional and efficient way it is operating this very important heritage site”. “the Touristic site of Jeita grotto have participated in Sukleen’s ‘Sorting of Recyclables’ campaign and they have joined our cause to preserve the environment for our community”. 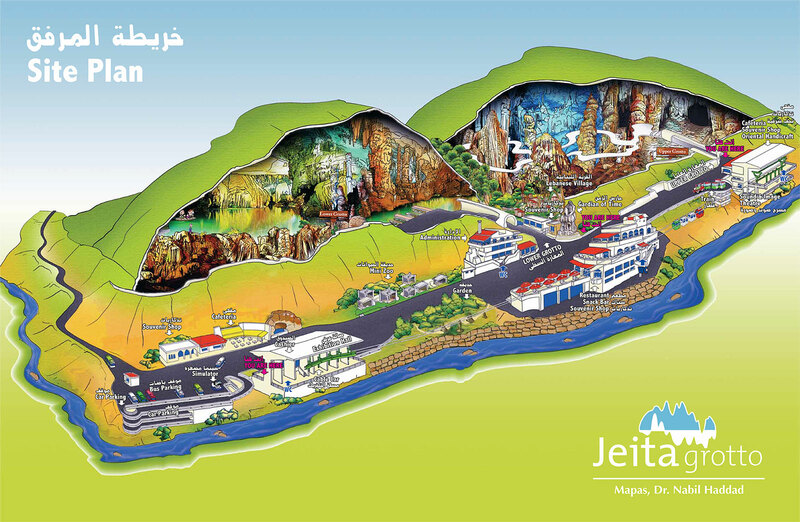 20/02/2000- Certificate of acknowledgement: “the Touristic site of Jeita grotto have participated in Sukleen’s ‘Sorting of Recyclables’ campaign and they have joined our cause to preserve the environment for our community”. 30/05/2001- “I have very pleasant memories of my recent visit to Lebanon, which left a deep impression on me. In addition to my official meetings and negociations I was also able, thanks to you, to see some of Lebanon’s beautiful nature, and especially the interesting cave which we visited. I believe that the film I am sending you will remind you of a number of the pleasant times we spent together. Dear Mr. Haddad, I send you my many kind regards from Slovakia and wish you good health, contentment in your life and success in your work”. 17/08/2001- “Le cas de la grotte de Jeita constitue, sans nul doute, un exemple de bonne pratique de gestion d’un site écotouristique, et nous sommes ravis de l’inclure à la publication de ‘une compilation de bonnes pratiques dans le développement et la gestion de l’écotourisme’ ”. 14/2/2001 – “The operators of Jeita grotto have kept the installation of the Ropeway in an immaculate condition both technically and optically. We would like to thank them for their extraordinary efforts”. 10/05/2001- “I have to congratulate you and your collaborators for an excellent way in which you re-opened the cave for public. Combination of the entertainment and fun with the knowledge on karst and cave is a fruitful symbiotics, very unusual in numerous other open-to-public cave in the whole World”. 14/05/2001- “I enjoyed a lot the visit because, as I told you, your show cave is perhaps one of the best in the world from the scenic point of view and also is well managed”. 30/10/2002- “De passage au Liban j’ai eu le plaisir de visiter les grottes de Jeita. Je tiens à vous dire combien j’ai été enthousiasmé par la beauté du site, des travaux effectués et aussi de la qualité artistique de l’éclairage qui met en valeur cette magnifique cathédrale souterraine. Bravo! à tous ceux qui ont œuvré à une pareille réussite. Une telle richesse devrait, à mon sens, être classée par l’État Libanais, voire même par l’Unesco ou toute autre organization chargée de la protection des sites”. 30/10/2002- “De passage au Liban j’ai eu le plaisir de visiter les grottes de Jeita. Je tiens à vous dire combien j’ai été enthousiasmé par la beauté du site, des travaux effectués et aussi de la qualité artistique de l’éclairage qui met en valeur cette magnifique cathédrale souterraine. Bravo! à tous ceux qui ont œuvré à une pareille réussite. Une telle richesse devrait, à mon sens, être classée par l’État Libanais, voire même par l’Unesco ou toute autre organization chargée de la protection des sites”. 04/05/2009- “Nous avons été séduits par la qualité de ce site, réouvert au public en 1995, et qui est aujourd’hui, un haut lieu touristique au Liban. Je connais votre investissement concernant la sauvegarde de ce lieu hors du commun, notamment en terme de préservation de la nature. Comme vous le savez, aujourd’hui la protection de l’environnement est une thématique importante des différentes politiques menées en France et je suis très sensible à votre engagement en ce sens”. 04/05/2009- “Nous avons été séduits par la qualité de ce site, réouvert au public en 1995, et qui est aujourd’hui, un haut lieu touristique au Liban. Je connais votre investissement concernant la sauvegarde de ce lieu hors du commun, notamment en terme de préservation de la nature. Comme vous le savez, aujourd’hui la protection de l’environnement est une thématique importante des différentes politiques menées en France et je suis très sensible à votre engagement en ce sens”. 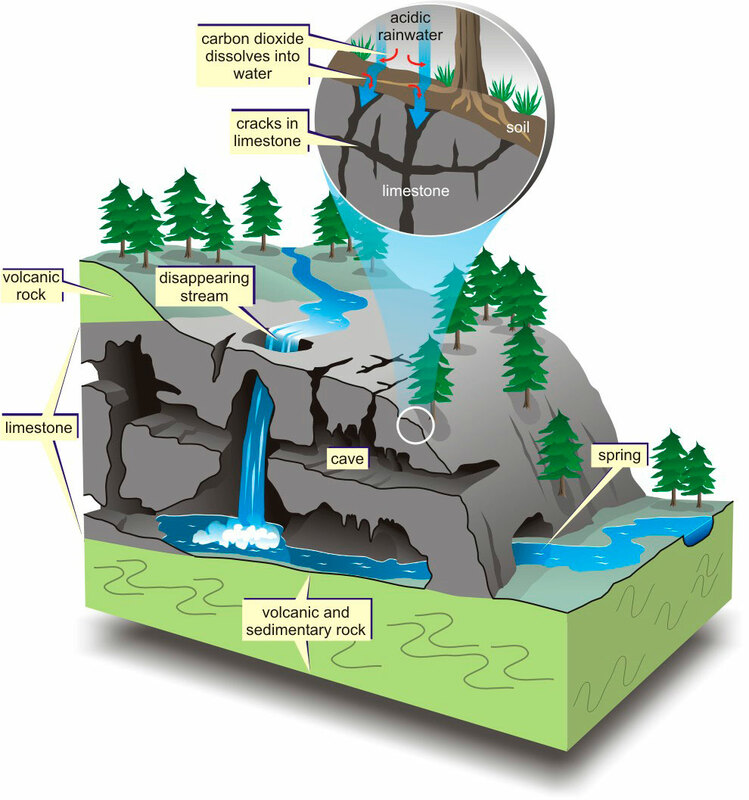 10/06/2014- “Nous avons été touchés particulièrement par votre amour et votre dévouement pour cette grotte et avons pu ainsi profiter un peu de votre science et votre grand savoir dans le domaine”. 03/07/2014- “We know that the grotto is worthy of the title ‘Certificate of Excellence’ by Tripadvisor, USA, because she is charming, comfortable of being visited and really very beautiful. Nevertheless, many other show caves, which also were beautiful, lost the charm for they have not been managed correctly. This is more one point that the Jeita Grotto has as advantage – it is managed very close of the excellence. Mr. José Ayrton Labegalini, expert speleologist, past President and actually in the advisory committee of I.U.S. (International Union of Speleology), Brasilian.